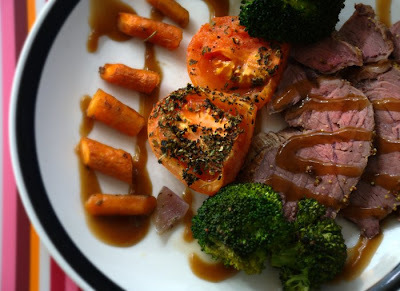 Although we don't often eat red meat, we recently made 2 roasts. The first one we bought was an organic leg roast from Marché Jean Talon. We didn’t have to add anything special and the flavour and texture were incredible. The second one we bought was a top sirloin roast from the "regular" grocery store and it was twice as big and about 1/3 of the price. The results were very different. 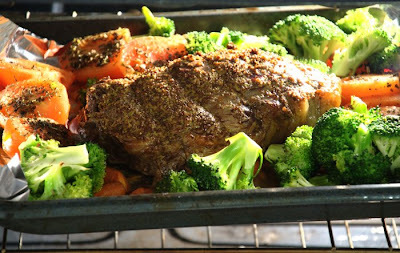 The organic roast was so flavourful and the texture was very tender. We were surprised at how easy it was to cook a really good roast. With the second roast, the flavour was very good but the texture was tougher. It was marbled (with fat) and should have been cooked in the slow cooker. Fattier cuts should be cooked longer at a lower heat. We will definitely try both again but we won't cook them the same way. The pictures above are of the top sirloin roast that should have been slow cooked.